As we have watched and read about President Trump and his NATO visit, he as expected has taken some major heat over the way he spoke to our allies at NATO meeting earlier this week. He further noted that, this has been going on for decades. This has been brought up by other presidents, but other presidents never did anything about it. It’s very unfair to our country, it’s very unfair to our taxpayers, and I think that these countries have to step it up not over a 10-year period— they have to step it up immediately. 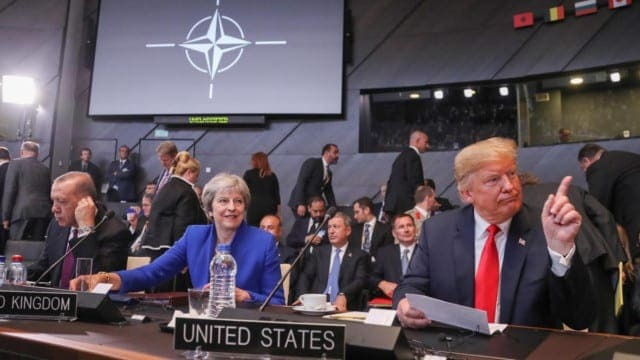 Despite the criticism from the Democrats and the political-left and the mainstream who have been apoplectic over his comments, the reality is that President Trump was 100% accurate in his assessment of NATO’s problems. The below chart from NATO, dated just last year, in itself reveals the truth that the President speaks to. As President Trump referenced, The United States spends more on NATO’s defense than every other nation in the alliance put together. In fact, if you added all of those nations together and doubled the total… the United States would still be spending more! 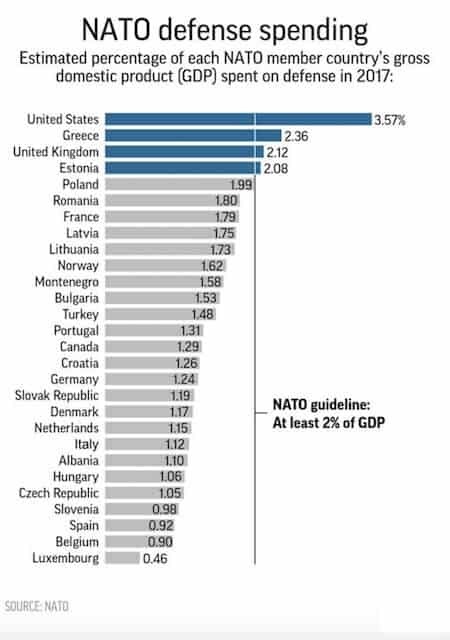 What’s even worse, the last time NATO’s leaders got together they agreed that each nation would raise their defense spending to 2% of their GDP and only Greece, the UK, Estonia, and Poland, for the most part are the only nations that have gotten there. To be fair, most of NATO has been increasing defense spending, but most (Germany in particular) are still way off the mark. Furthermore, in fact, Germany, as Europe’s leader (unofficially because of its economy) has the most to be ashamed for. For this reason, it is why the President was so direct in calling Germany and several other countries on the carpet for their hypocrisy. President Trump’s comments about Germany’s problematic behavior is correct and it indeed put Berlin in a critical situation and position with Russia. I should note here that, most seem to forget in July 1982, Ronald Reagan warned Europe that a new pipeline from Russia for oil and gas would weaken the Europe and the West … saying; “Our strategy is aimed at limiting Soviet (Russia) economic leverage over the West”. Likewise, the President’s oft-expressed view that NATO is obsolete, is in a sense perhaps true because it does in fact give leverage to Moscow over Germany’s and Europe’s dependency on Russia. It has always been that the strength and preservation of the NATO alliance is in America’s vital national interest, and to which Trump has made a point of. While his critics claim that Trump’s tough rhetoric and his admonishing of NATO undermines his efforts to bolster NATO, he is actually doing America a great disservice. I tend to totally disagree! With all that said, he is absolutely, positively right to be upset at the state of the German military and the overall readiness and capability of NATO — it’s indefensibly weak and unprepared. We must not forget, NATO isn’t a social club. First and foremost it is a military deterrence. It’s a military alliance, and even if one posits that Germany shouldn’t reach its full potential military strength (for obvious historical reasons), can’t we at least ask that it not be a pale shadow of its recent, West German past? And certainly, not a dependent and unofficial client state of Russia for energy. Even France is concerned, in its explanation of how Germany’s military continues to crumble, even as Germany becomes more reliant upon Russia’s oil and gas. This is a dangerous combination and precedent, and one that President Trump is right to be worried about. The mainstream media, of course, spent most of the last few days attacking President Trump’s treatment of our NATO allies. Reading the stories coming out of the NATO meetings, one would have believed that NATO was on the brink of collapse, and all because of what President Trump was saying – but, again, all true things. Taking heed from the American Commander-in-Chief, in the end, NATO leaders made an “unwavering commitment” to shoulder a greater share of the military-preparedness burden on Wednesday after President Trump lambasted alliance members generally, and Germany specifically — for failing to pull and carry their weight. In reality, this is good news. Now, the next step will be to convince Europe that buying Russian oil/gas might be easier and cheaper… but in the end it’s against their own interests. In fact, the best way to convince Germany to end their reliance on Russia for energy is to provide Europe with a cheaper alternative. As the world’s largest energy producer, the United States have the ability to help meet Europe’s energy needs… so it will be critical to find efficient and effect way to do it. I’ll lean forward and suggest our President already has a plan. So, it is laudable to say that Trump NATO summit was highly effective and productive, with the United States, by way of President Trump reasserting itself as NATO’s leader and vanguard. To reassure America’s role, it took Trump to make that happen. Yes, Donald Trump is doing things that are unconventional and things that are unorthodox, but he is doing things that is good for the free world and good for America. And, yes, Donald Trump gives the unvarnished truth and sometimes he is not as diplomatic as conventional thinking desires. But in the end, and after the fact, world leaders have come out and are saying the respect and like him. In the end, you have to look at the results and the accomplishments that he said he wanted to do, and is doing what and he has promised to — and he has. He is doing this for us as Americans first.